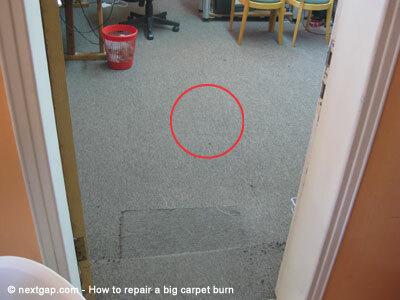 Here is a manual on how to fix a damaged area in a wall to wall carpet. It’s not expensive to replace the carpet but it involves removing all of the things on the carpet or at least relocating them to one side and then to the other as the carpet is replaced, but as this is my office, I really don’t want to get into it, and rather just make a repair on the spot, so this is what I did, and here are my tips on it, if you ever need to do it too. make your template from a paper, put it on the stain and see if it covers it all. make it a even square (with 4 even sides). take the paper and now a cut a replacement new piece from your leftover carpet. Pay attention to the carpet thread direction. when you’re satisfied, carefully put a large glass or wood on the repaired area and a few books. If you do the cutting precisely, both the stain area and the replacement piece, the repair should be hardly noticeable.